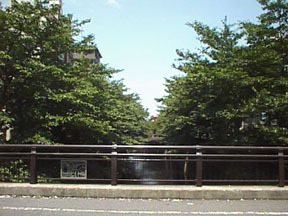 The Meguro river is a tightly controlled river running right through the middle of the city. We cross over the river every day on our way to work. Where we cross it, the river is maybe 25 feet across and about 30 feet below us. The water is very shallow and on most days ducks can often stand in the deepest section. We are curious though as to whether the river will become deeper at some time of the year because the very shallow river is running through a purpose built course that is at least 30 feet deep. One day when it was raining, Seth stopped to watch the river flowing fast and higher than ever before. We are waiting for Spring to see what water levels are because from the sides of the river course, there are water marks 20-25 feet above the current level. We are also waiting for Spring because the river is lined with Cherry trees. We can imagine how beautiful the trees will be when they are all in bloom. The little shopping street we found hooks on. Tara had rejected other hooks for months and months and months. Finally, she found THE PERFECT hooks on a cute shopping street. The two busses we JUST missed were the only busses coming for a long time. We would have made the busses except that we didn't have any change for them, so we had to go to the corner vending machine. Tara really enjoyed her hot apple juice, especially in the chilly weather. The shopping mall with the Scandinavian group singing Christmas carols was a total surprise. We even found a shop with a nice wooden photo album. The direct taxi ride home along one street showed us glimpses of the river we had walked along. It nice to get an overview of everywhere we walked. We even saw a close by Denny's we hadn't known about before. Looking at the map and seeing Tokyo Wharf Park after getting home showed us just how close we were to a park when we decided to turn back instead of continuing onto the Rainbow Bridge.